The StarSpirit Scholars Program is an outgrowth of the Larteh Schools Project, but specifically seeks to provide scholarships for children to attend school who would not otherwise be able to go to school. Recently, Ghana began funding elementary education. However, now that parents on this level no longer have to pay school fees, many parents are still too poor to pay for uniforms, shoes, books, or other school supplies. Many young children are not able to go to school, as a result. Also, older children in middle and secondary school still have the burden of school fees. 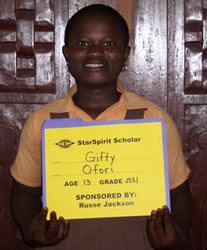 Thus, in Fall 2005 we launched the StarSpirit Scholars Program, starting with the funding of 30 StarSpirit Scholars. Scholars write letters to their sponsors, and sponsors receive photographs of the children they sponsor. This Fall 2006 we have 34 StarSpirit Scholars, with many sponsors having the same children for a second year and committing to those children for the future years of their education. This includes 4 children sent to school because of funds raised by the Germantown Friends School in Philadelphia. Our theme for this program follows the wisdom of an Elder in the Philadelphia Community who urges others, as follows: "Instead of giving a gift to someone who has everything, send an African child to school," making a donation to StarSpirit International, Inc. in the name of the person "gifted"-so to speak. We expect this relatively new program to become quite popular and to grow tremendously. You can make donations to this project.